I found this recipe in an old church cookbook and decided to give it a try. It turned out really tasty. It was completely different from my usual ground beef chili but we liked it immensely! 1. Combine the first 5 ingredients in a small bowl and set aside. 2. Heat the oil in a 3-quart saucepan over medium-high heat; add the chicken and cook until meat is no longer pink. Remove chicken from pan and set aside. 3. Add the chopped onion to the pan; cook 2 minutes. Stir in the chicken broth, green chilies and spice blend; cover and simmer 30 minutes. 4. 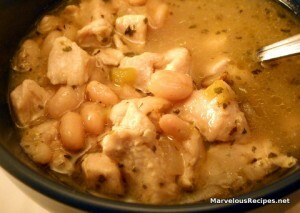 Stir in the cooked chicken and beans; cover and simmer for an additional 10 minutes. Garnish with shredded cheese, if desired. Makes 4 servings. Note: I like to serve this with warm cornbread muffins. I think I have all the ingredients to make that this weekend! I bet my family will love it.